ArmInfo. 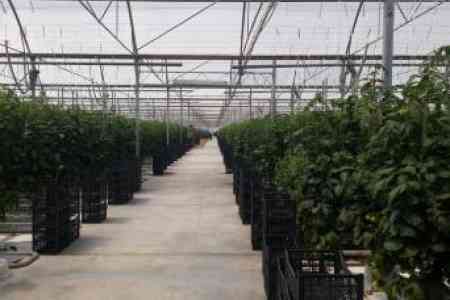 The Ministry of Agriculture of Armenia is developing a leasing program for the development of small and medium-sized greenhouse farms in order to stimulate a small family business and increase production efficiency. Minister of Agriculture of Armenia Ignaty Arakelyan informed about it during the meeting with the chairman of the Association of Greenhouse Farms of the RA Poghos Gevorgyan and representatives of the sphere. According to the press service of the ministry, along with this, the Ministry is working on the development of a program for the installation of refrigeration equipment, which will ensure proper storage of products for export. Representatives of the sphere, present at the meeting, raised the issue of import of Turkish vegetables and fruits; the possibility of conducting laboratory tests of the quality of fertilizers and pesticides; training of qualified specialists and a number of other issues. In order to expand and develop the sphere, the meeting participants stressed the importance of providing loans at affordable interest rates. To that, I. Arakelyan noted that with the aim of solving all the problems presented, the Ministry will work on the development of the program, which it will submit to the RA government for consideration.